Congressperson Alexandria Ocasio-Cortez shook the nation with a suggestion that the United States return to a progressive tax that would reach 70 percent for incomes over $10 million. Senator and Democratic presidential candidate Elizabeth Warren followed up on Jan. 24 with a proposal for an annual wealth tax on households with a net worth over $50 million. According to the University of California, Berkeley, Warren’s proposal would only impact 75,000 U.S. households. But any tax on accumulated or earned wealth above a certain level can be seen by wealthy investors as a personal attack. Spectrem regularly asks investors how they feel about their current tax standing, and has also asked about the possibility that wealthy investors might contribute more than they currently are required to do by today’s tax laws. In Spectrem’s study Financial Behaviors and the Investor’s Mindset, Ultra High Net Worth investors with a net worth between $5 million and $25 million were asked what they thought was a fair rate for them to pay. With 40 percent as the highest tax rate suggested, 4 percent felt that level was appropriate, 7 percent felt a 35 percent rate was satisfactory, and 12 percent felt 33 percent was fair. In 2017, 52 percent of UHNW investors said tax increases were a concern for them, but that percentage was way down from the 72 percent who agreed with that statement in 2016. 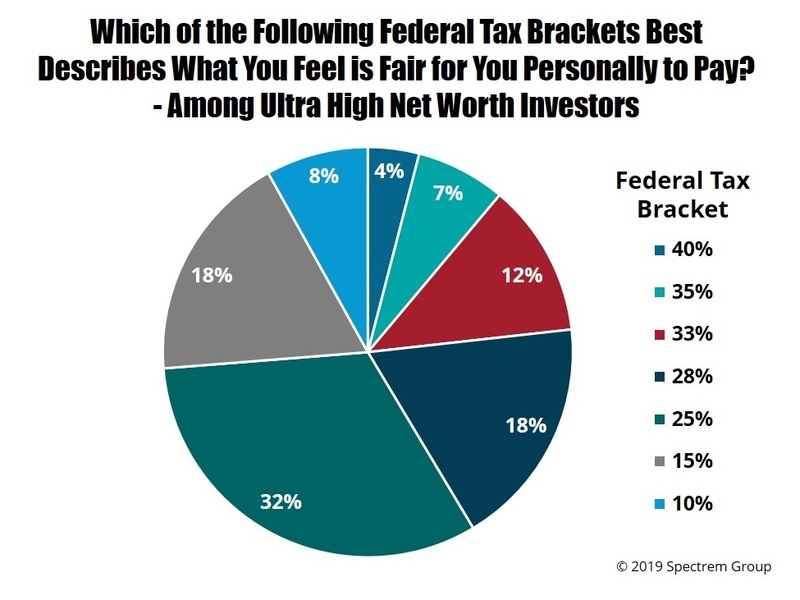 In Financial Behaviors and the Investor’s Mindset, 58 percent of UHNW investors agreed that “the most wealthy should pay a greater portion of taxes”. Of course, even with everyone paying the same effective rate, wealthy individuals would pay more in sheer dollars. In that same study, 58 percent of UHNW investors felt they were paying too much in taxes.